Getting admitted to UBC can feel like one long marathon. But congrats—you’re now past the finish line! As you celebrate this milestone and take the next step in your UBC journey, remember that you’re bringing a diverse set of accomplishments with you—and these can take the form of transfer credits. 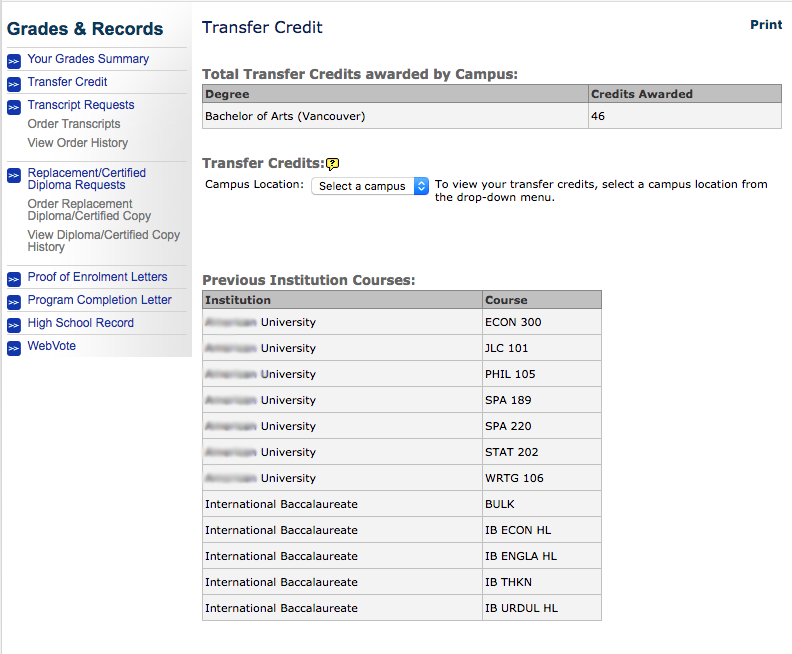 Transfer credits are basically any credits applied towards your degree at UBC for courses taken outside of UBC. For example, if you took International Baccalaureate, Advanced Placement, or Cambridge A-levels coursework in high school, you will likely have transfer credits for certain courses that are either specific to a course or are within a certain discipline (e.g. BIOL 1st, ENGL 1st). If you’re joining UBC as a transfer student, your time at another institution can also translate into transfer credits. Why should I pursue getting transfer credits? Every course costs time and money. Making the most of your transfer credits allows you to save time and money to use elsewhere—for example, exploring elective courses you’re interested in or perhaps saving up for an exchange trip. Personally, when I transferred to UBC, I pursued getting transfer credits for my high school IB courses as well as university courses I’d taken at my previous institution. Because I was changing my major, getting transfer credits helped to satisfy elective and prerequisite requirements, which in turn, gave me more room to explore other courses as part of my new degree. I should mention that I also ended up saving around $15,000 when I applied my previous coursework to my new major! Lastly, as a transfer student, it was also important for me to stay on track timewise. Transfer credits allowed me to truly continue my studies—because nothing you learn is ever wasted. Start with scanning your SSC for a summary of transfer credits already granted to you (sample of what this looks like shown below—click to expand). If you previously studied in BC, you can see what you are eligible to receive in the BC Transfer Guide, which lets you check for both high school and post-secondary transfer credits. If you came to UBC directly from high school, you can also use UBC’s first-year credit tool to check for applicable transfer credits. If you see a discrepancy from what you’re expecting or have questions about the transfer credits initially listed in your SSC, follow up with the UBC Admissions office (unless it’s exchange credit—then follow up with your academic advising office). When it comes to getting transfer credits applied to your degree, there are no hard-and-fast rules because everyone’s situation is unique. Reach out to your faculty, departmental, and/or program academic advisors to discuss your individual case whenever you feel like there’s a chance you can get credit for previous coursework. For example, I took IB Urdu language courses in high school, but I was unsure if they could fulfill the Arts language requirement. I emailed my Arts Academic Advisor requesting him to review my IB transcript and it turned out I had fulfilled the requirement. Due to the difficulty level of the Urdu courses and the marks I attained, I was also granted 6 additional credits that count towards my 120-credit degree requirement. When I started my major and minor program (in International Relations and Economics, respectively), I met with advisors in both departments again to see if my transfer credits could be used in any way. Upon reviewing my transcripts, they were able to apply my transfer credits to specific program requirements. This meant I did not have to take 12 credits of another language (separate from the Arts language requirement), which was required for my IR major. Had I wanted to learn another language, I could have but I chose to ease my course load a bit and to make space to get involved in campus life. Of course, I also saved some money in the process! Throughout your degree, and especially if you are eligible for transfer credits, the SSC’s Degree Navigator can be a great resource to help you plan ahead. Depending on which program you’re in, this tool can give you access to your degree report based on your faculty, major, and (if applicable) minor program. 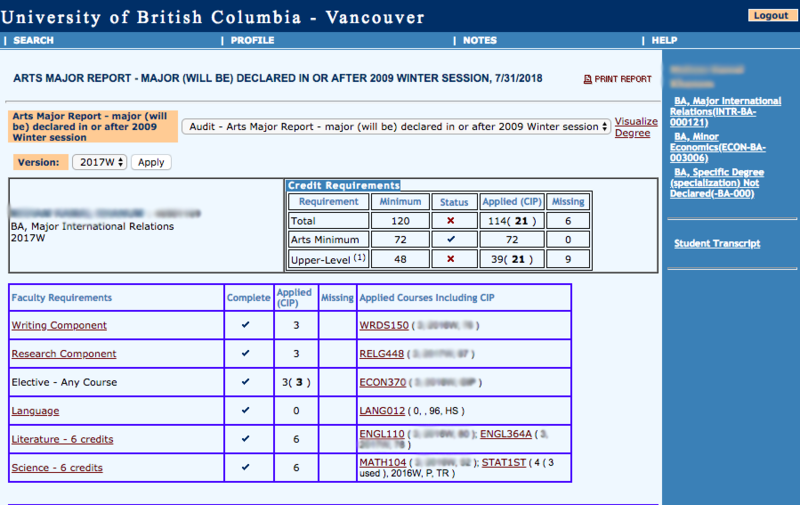 Degree Navigator shows all of your courses (from other institutions or taken at UBC) and if and how they apply to your degree requirements. It also tracks your progress towards graduation by showing green check marks in front of requirements you have completed and red Xs in front of credits you are still missing. If you expand the sample SSC screenshot below, you can spot codes like ‘TR’ or ‘HS’. These indicate which credits you have brought with you to UBC, and those that have been applied to your degree program requirements. Keep in mind that Degree Navigator is a handy tool but doesn’t serve as the “definitive answer” on your degree requirements for graduation. Remember: what you did before UBC counts—whether you’re coming from high school or another university—and maximizing transfer credits is one way to recognize your past accomplishments! It might take a little time and proactive work on your part to get transfer credits applied to your degree, but trust me, it’ll be worth it in the end.